Advertising is the Internet’s main business model. How can publishers exceed the lost advertising revenues and content displays taken by dominant platforms like Google and Facebook? How can media prevent its decline as OTT (Over-the-Top) streaming captures their subscribed audience? Though these threats keep growing, content leaders could rise to the top instead of being replaced. A new 21st Century exponential growth paradigm is needed for publishers and media to remain prosperous leaders. This Media 2025 series introduces new technology for a media-based, two-way, always-on Digital Earth. This will become one of the most powerful ways to live, work, learn, and be entertained. This platform delivers humanity’s combined knowledge and resources as an embedded part of continuously connected living and working. Its people-first technology is based on delivering prosperity, protection, and greatness to everyone personally. This global digital transformation will be different because of digital’s speed and scale. One or more publishers can lead this, restoring the balance between people, publishing, and dominant digital platforms. As these new leaders rise to lead a transformed industry, they can help people, publishers, and media rise by providing their people-first platform as a universal, scalable cloud service. How can you lead the publishing industry and then the world? By competing with the new paradigm of a people-first planet. Here’s where you learn how. Brief illustration of a new Exponential Publishing Platform: multiple continuous connections are maintained in each shared space. Personal protection is controlled by each person through their digital boundaries. Comfort and speed are added across screens by turning devices into consistent families. These blend current screens, new elements, and AR, VR, and MR as they arrive. Success is embedded in every step with active knowledge, active resources, and active commerce. This produces a seamless Digital Earth experience across screens, people, resources, new devices,web and combinations of technologies. Advertising has failed many publishers and websites as a major revenue source. According to Fortune, “Google and Facebook…account for more than three-quarters of the U.S. digital ad market.” These two companies took nearly 20% of the world’s advertising revenue, a combined $106 billion in 2016. The largest category of ad spending will become “total digital” in 2017, surpassing TV advertising according to eMarketer. Market value: 81% or $2.059t of $2.545t in public & private Internet market, market capitalization. Is the future for media companies simply one of deciding which of two giant walled gardens they wish to build a majority of their business on, or pay rent to? Second, inequality is increased by this new economic dominance. A growing proportion of people’s screen displays are managed by Google’s and Facebook’s advertising platforms. Technology eliminates jobs, and many people who lose their job to new technology don’t have the new skills to fit the new work environment, so they fall out of the middle class. Wealth is moved to the top. Three of these four companies have already moved their founders to Oxfam’s list of the 8 wealthiest men in the world, who own the same wealth as half the world (3.5 billion people): Jeff Bezos, Mark Zuckerberg, and Bill Gates. Lockdown comes from decades of stagnant middle class earnings, high debts, and digital surveillance. Regulatory agencies, politicians, and governments are captured by super-wealthy elites, to serve their business, regulatory, and tax reduction needs. Today’s corporate R&D creates corporate-first technologies that drive this. The billion-user platforms are building tomorrow’s digital infrastructure. Their systems track and target each person, and either sell them to advertisers, or sell them directly using recommendations, which often use persuasion technologies. We think the billion-user platforms are only consuming more industries: retail stores close, publishing declines, logistics companies are replaced, and many in the middle class lose their jobs as tech raises productivity and reduces costs. AI looms as the next turn in the screw. Google is funding the creation of AI that writes news stories. AI could replace entire news rooms by digesting news streams and creating their own articles, eliminating revenue sharing with publishers. This is a personal threat to the job of every publishing employee reading this. The real issue is the global scale of these companies’ roadmaps, as each races to build their version of our future. If the billion-user platforms complete their capture of the world’s digital infrastructure, they will increase the concentration of the world’s wealth and power for decades to come. People’s anger and frustrations have already produced Brexit and Donald Trump. Each time populist anger returns, its frustrations may cause instabilities that lower the world’s ability to deal with climate change that will flood coastlines, destabilize food production, trigger mass migrations, cause shortages of water and other resources, and spark regional conflicts that cause millions more to flee. 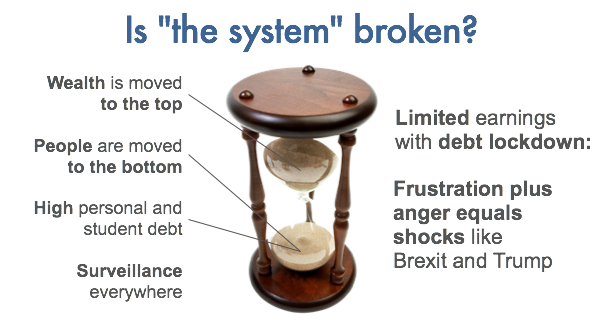 These crises may be on an unimagined scale and combination. Rising sea levels may force unprecedented migrations from low coastal plains, Rising temperatures may reduce entire regions’ food production. The resulting political stresses may destabilize governments in the countries where these mass migrations originate, and overwhelm the destination countries. Even the early shocks of potential cataclysms may exceed the abilities of today’s governments and institutions. What if political elites then make it their highest priority to protect the safety of super-elites? They can exploit widespread fears and flip the “on” switch that unleashes militarized surveillance-empowered police who expand micro-control over every person. Instead of that dystopia, what is humanity’s alternative and who will lead it? The wealthy future promised by technology is here, but technology’s use is obviously corporate-first and not people-first. Today’s corporate-first platforms make a few wealthy, while the wealth of “people” is excluded. Instead of dying peacefully, publishers could compete with a new publishing paradigm: One or more publishers can use the coming decade’s global digital transformation to lead the addition of a two-way Publishing Platform based on a people-first Digital Earth. The opportunity is to be the “publisher” of a successful planet that clearly benefits people and increases digital growth for everyone. The economy and governments retain their core values of capitalism and universal human values of peace and freedom. To help preserve these, this adds new people-first technology and a people-first business model. This new combination produces Partnership Capitalism that will then include both people and companies. Instead of today’s winners-eat-all economy—where a few exponential competitors consume leading companies and capture economies—this platform adds scalable cloud services. Many leading companies could buy and deliver their people-first digital transformation as a cloud service. Their role switches from not being able to catch up to taking the lead. These people-first companies can go to market as leaders of a prosperous and successful Digital Earth that helps every person succeed. Media 2025 introduces the start of this new media-based, two-way, always-on Exponential Growth Publishing Platform. This will become one of the most powerful ways to live, work, learn, and be entertained. This global digital growth will be different because of its speed, scale and usefulness. New power connections in multiple Shared Planetary Life Spaces: Live, continuous connections with people, tools, places, resources, and more. Put a powerful Digital Earth at your fingertips, under your control, in your multiple Shared Spaces. This turns all your devices into one “device family,” with you in control of all of your screens. 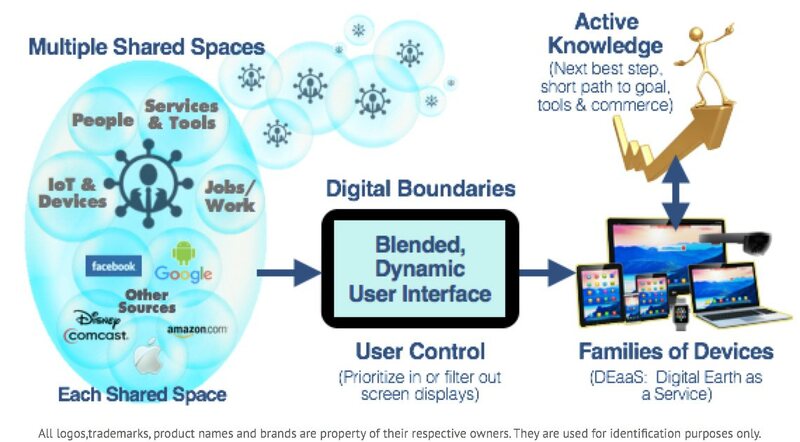 New protections from Digital Boundaries: Each user controls their screens’ displays. This protects people in multiple ways, both physically and digitally. It creates Connected Consumption with each person’s trusted and preferred vendors, while excluding others. The worlds most valuable real estate will be the user-controlled user interface on devices. People-first companies can appear, but not others—so each person’s control helps decide the companies that thrive. For example, if you choose healthy food and renewable energy, then those products are visible while others vanish from your devices. It’s Partnership Capitalism: You choose the world and life that’s best for you. Your preferred vendors earn more from your Connected Consumption, by making sure you live the high-quality life you want. New prosperity and abilities from Active Knowledge, Active Resources, and Active Commerce: We are wirelessly surrounded by the world’s best knowledge, tools, and commercial choices, but those are disconnected from what we do digitally. With Shared Spaces and Connected Consumption you’re the trigger. As you do anything digitally, responsive cloud publishing brings you an embedded, invisible channel that is part of each step you take: You can ask for your “next best step” or the “short path to your goal.” You aren’t interrupted to search, look for a better tool, or shop. Being connected brings you instant guidance, resources, and commerce that’s a natural part of how you live. New “devices family,” instead of countless separations: Think of a world that knows you and serves you across all of your devices. Your digital life becomes as clear and direct as the physical world. You enjoy an easy and successful experience in everything you do digitally. Your control is complete as you move from device to device, place to place, and time to time. PPG Publishing delivers a “Digital Earth as a Service” (DEaaS). This turns all your screens into one “devices family,” and makes your Digital Earth the one “place” where the world serves you and makes you successful everywhere. This, and more, is now buildable by one or more leading publishers, media companies, advertising technology companies, marketing automation, and other tech companies. They can multiply their digital growth and scope by adding a People-First Publishing Platform that starts a universally prosperous and protected Digital Earth. This two-way publishing serves people, and also people-first companies, with new ecosystems that grow the leadership of both each person and people-first companies. It also adds a precipice for companies that exclude people, don’t share their values, or damage the Earth. Digital Boundaries are a kill switch to shut out companies and products that each person does not want to see on their screens. Just as companies can use computing to create and dynamically deliver customized content to each screen, each person can use their rights to control what they see on their screens. If a person excludes a company, that company can be displayed again when they listen to that person’s choices and sell products and services that person wants to see. People have many types of desires to make their families better and happier, society work for everyone and this a healthy planet for all likes of animals, plants, and fish. They will soon gain new kinds of personal control. It’s simple. People already have the right to control what they see and do. They legally control their physical boundaries, and this adds Digital Boundaries. They legally switch their screens to what they want to see, and this adds personal instructions so screens display what they want, and computing switches off what they don’t want displayed. The unhealthy world vanishes, and those companies decline. When people limit the products and services displayed to the healthy lives and world wanted, people-first companies rise to economic leadership as they build and deliver the better world people choose. It’s Partnership Capitalism. Personal boundaries also transform how each person is tracked, targeted, and treated. New Connected Consumption adds always-on connections with people-first companies and raises barriers to excluded companies. Because screens are how we discover, learn and choose more every day, what screens display or block will switch how society grows and progresses to what people want to see and enjoy. Our economy did this before. When barbed wire was invented in the 1870s, farmers ended the cattle drives that ruined their crops. They fenced off their property, which created farming communities where it was safer to live and raise families. Digital Boundaries are like “digital barbed wire.” They give each person fences to add both digital and physical protections. These add protected two-way relationships. A continuously connected publishing platform embeds knowledge, tools and resources that are triggered by what people do through screens, as always on options. This is Active Knowledge, which helps every person succeed at the level of humanity’s combined knowledge, tools, resources and commerce. Think about a world that automagically increases everyone’s personal achievements, prosperity, wealth, and personal greatness as part of our normal online interactions—changing lives in years, instead of decades. A Digital Earth can be led by publishing and media companies that add a 21st century publishing platform to rise above today’s threats to their survival. This strategic response changes the publishing paradigm to a people-first platform that re-establishes those publishers’ digital growth and leadership. Will this built to a universal advance if a positive platform helps people, companies, and societies succeed? Once that begins, a cloud “Platform as a Service” (PaaS) can help many companies through Digital Transformation as a Service (DTaaS), so they can rapidly become digital leaders of a new people-first Digital Earth.